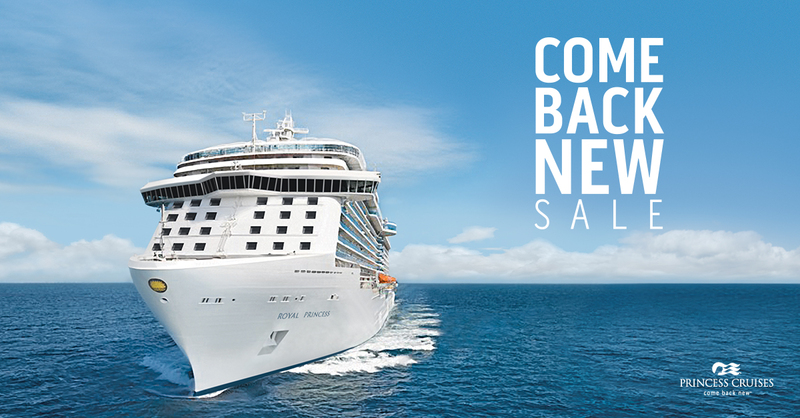 SANTA CLARITA, Calif. (March 16, 2016) – Princess Cruises announced the Come Back New Sale, offering guests up to $600 in free onboard spending money, and the opportunity to experience the line’s newest onboard enhancements delivering on the Come Back New Promise. In addition to onboard spending money, guests who book a suite during the Come Back New sale will receive a free Lotus Spa treatment, featuring the choice of a hydrating facial or 50-minute Swedish massage. As part of the Come Back New Promise, Princess invites guests to sample authentic and flavorful dishes from the cruise line’s exclusive specialty dining restaurants enjoy world-class entertainment experiences or immerse in the local cultures on Discovery recommended shore excursions — all assuring travelers come back fulfilled, energized and enriched from their cruise vacation. The sale offers deals on cruises to the line’s most popular destinations including Caribbean, Panama Canal, Mexico, California Coast, Hawaii, Canada and New England, Australia and New Zealand, South Pacific, Asia and South America, as well as Transoceanic and World Cruise voyages. In addition to special fares on cruises to the line’s top destinations, guests can book during Princess Cruise’s Come Back New Sale with a deposit of only $100, while third and fourth guest fares in the same stateroom are available from just $199 per person. More information about Princess Cruise’s Come Back New Sale can be found at princess.com/cruisedeals. All cruise prices are per guest, based on double occupancy. Princess Cruise’s Come Back New Sale runs through 11:59 p.m. PDT on May 12, 2016 and is available to residents of the United States, Canada, Puerto Rico and Mexico.